This is not the same picture that I describe in “Memory Pictures,” but it is the same Paul. 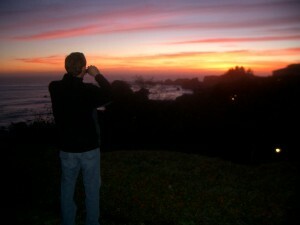 In this one he’s taking a picture of another sunset – 25 years later, and 40 miles north – from our home in The Cove at Brookings. “Old worlds keep closing in . . . they have before . . . they will again. Voices call beyond the wind . . . say we must go . . . beyond the end . . .